REFRESH� helps recreate the natural environment found in Japanese clay dams. 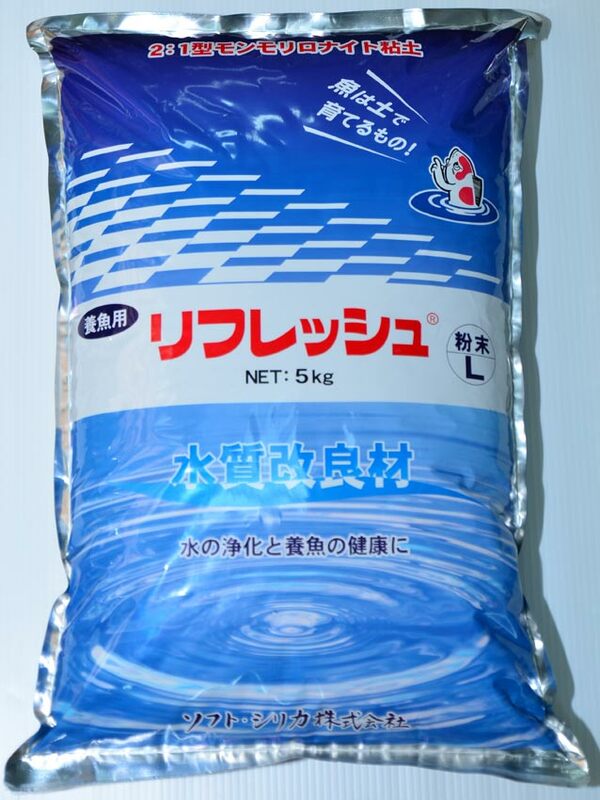 REFRESH� is clay mineral produced at Limited Mountain, Yasawagi district in Akita, Japan. Locals of the region have historically taken this clay as a secret medicine for various ailments and refer to it as marvelous soil or magic white soil. REFRESH� is wonderful gift from the earth, which cannot be produced artificially. REFRESH� is a pure natural montmorillonite clay containing 16 minerals beneficial to Koi including; silica, aluminum, calcium, magnesium, sodium, and iron as well as others. These effective minerals keep water clean and help to supply nutrition, dissolving slowly into the water through ion exchanges. It has been long known that Koi raised in clay damns grow better, have vivid colouring and excellent skin quality. REFRESH� helps recreate the natural environment found in these clay dams. About 200grams (one 180cc cup) of REFRESH� per 10,000 liters of water should be dissolved in a bucket of water and then added to the pond. The initial application could be twice this amount. Note, water can become cloudy for up to 10hrs after application.